Ghani: war in Afghanistan ‘has no religious justification’ and that those who believed in bloodshed and endangering peace should rethink their minds. President Ashraf Ghani on Tuesday stressed that the war in Afghanistan ‘has no religious justification’ and that those who believed in bloodshed and endangering peace should rethink their minds. In his Eidul Ahda holiday speech after offering Eid prayers at the Presidential Palace mosque, Ghani said he offered another ceasefire based on the national consensus. He added that their actions were based on consensus of Islamic scholars, the fatwa of 2,900 religious scholars, after which their fatwa was confirmed by the scholars of Indonesia and Makkah and all major Islamic centers. 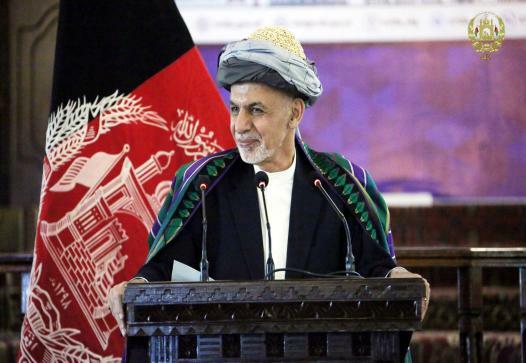 Ghani said 93 percent of the Afghanistan people wanted peace according to a recent poll.